Aug. 25, 2016 — The Winthrop P. Rockefeller Cancer Institute at the University of Arkansas for Medical Sciences (UAMS) got a boost in the fight against breast cancer with funds generated by QVC Presents “FFANY Shoes on Sale,” held in October 2015. 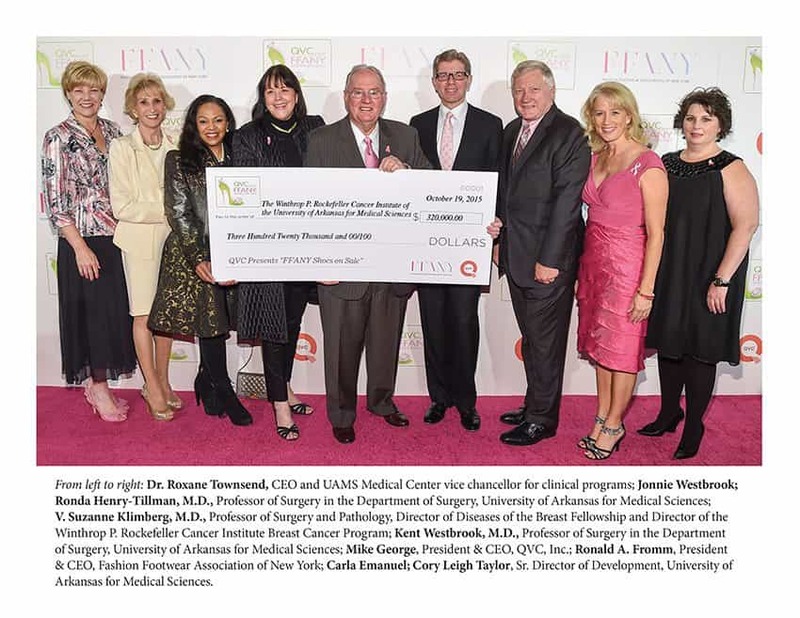 Supporting breast cancer research and education institutions nationwide, the Fashion Footwear Association of New York (FFANY) and QVC selected the UAMS Cancer Institute as one of the nine beneficiaries of the 2015 event. FFANY and QVC representatives presented a check in the amount of $320,000 to Kent Westbrook, M.D., Cancer Institute co-founder and distinguished professor in the UAMS College of Medicine, along with other UAMS representatives. “It’s an honor to be one of only nine cancer centers across the country chosen to participate in this annual event. Support such as this helps us educate women in Arkansas about the importance of breast cancer screening while also continuing our search for better treatment options,” said Cancer Institute Director Peter Emanuel, M.D. During the course of 17 years, the UAMS Cancer Institute has received more than $5.6 million in donations resulting from this sale. Since its inception, QVC Presents “FFANY Shoes on Sale” has sold more than 1.8 million pairs of shoes and generated more than $50 million to benefit leading breast cancer research and education institutions. Designated as the event’s “Special Pink Benefactors,” Nine West Group, Caleres, Camuto Group and Marc Fisher Footwear each donated shoes worth more than $500,000. Their contributions included brands such as Nine West, Anne Klein, Easy Spirit, Via Spiga, Franco Sarto, Naturalizer, Vince Camuto, BCBGMAXAZRIA, Jessica Simpson, Guess, Tommy Hilfiger and Ivanka Trump. QVC, Inc., a wholly owned subsidiary of Liberty Interactive Corporation (NASDAQ: QVCA, QVCB), is the world’s leading video and ecommerce retailer. QVC is committed to providing its customers with thousands of the most innovative and contemporary beauty, fashion, jewelry and home products. Its programming is distributed to approximately 358 million homes worldwide through operations in the U.S., Japan, Germany, United Kingdom, Italy, France and a joint venture in China. Based in West Chester, Pa. and founded in 1986, QVC has evolved from a TV shopping company to a leading ecommerce and mobile commerce retailer. The company’s website, QVC.com, is ranked among the top general merchant Internet sites. QVC, Q, and the Q Ribbon Logo are registered service marks of ER Marks, Inc. The Fashion Footwear Charitable Foundation was created to support ongoing research and education programs in the fight against breast cancer and is supported by members of the Fashion Footwear Association of New York (FFANY). Donated footwear is sold on live television through QVC during the Fashion Footwear Charitable Foundation’s annual charity benefit, QVC Presents “FFANY Shoes on Sale.” Funds are distributed to leading breast cancer research and education institutions across the United States, including beneficiaries for the 2015 event: The Abramson Cancer Center of the University of Pennsylvania, The Breast Cancer Research Foundation, The Samuel Oschin Comprehensive Cancer Institute at Cedars-Sinai Medical Center, The Susan F. Smith Center for Women’s Cancers at Dana-Farber Cancer Institute, The University of Michigan Comprehensive Cancer Center’s Breast Oncology Program, The University of Pittsburgh Cancer Institute, The Winthrop P. Rockefeller Cancer Institute of the University of Arkansas for Medical Sciences, The Alvin J. Siteman Cancer Center at Barnes-Jewish Hospital and Washington University School of Medicine, The Margie and Robert E. Petersen Breast Cancer Research Program at the John Wayne Cancer Institute at Providence Saint John’s Health Center. The Fashion Footwear Charitable Foundation makes its home at 274 Madison Avenue, Suite 1701, New York, NY 10016, www.FFANY.org.